If there's one thing I've learned about heterosexual women, it's that they like men. They enjoy their company. They even marry them, sometimes. But they love cupcakes. And if there's another thing I know, it's that single women are on Tinder. 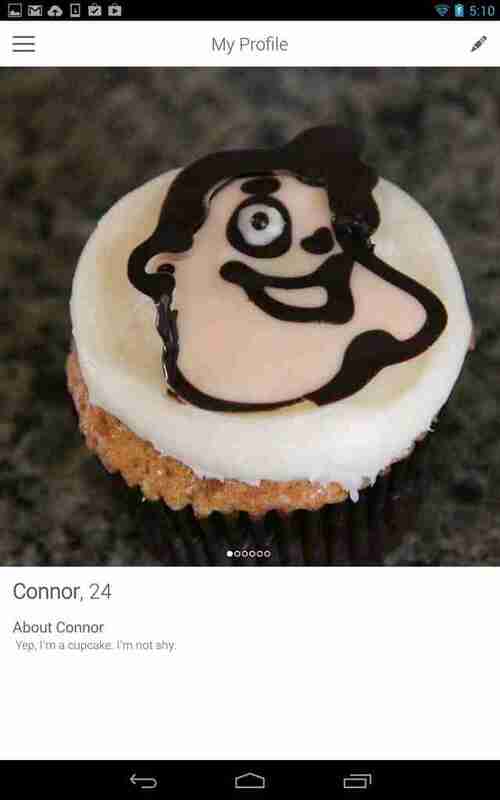 Armed with those two pieces of knowledge, I set out to create a Tinder persona that no woman could resist: a man's face drawn on a cupcake. 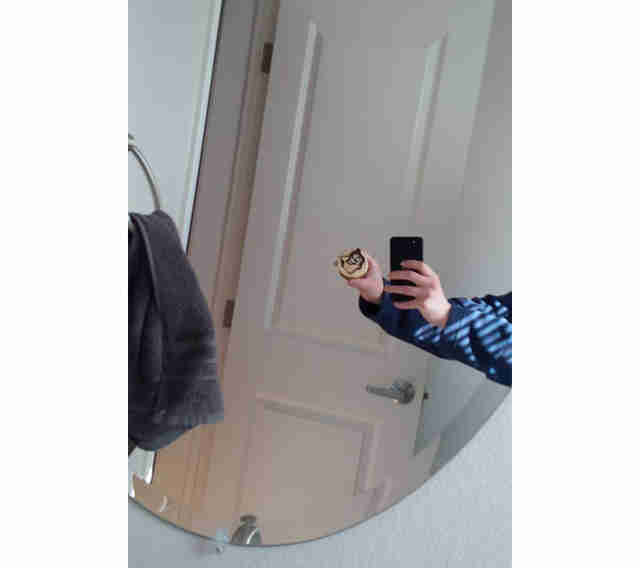 Here's the cupcake at home, before all hell broke loose on Tinder. 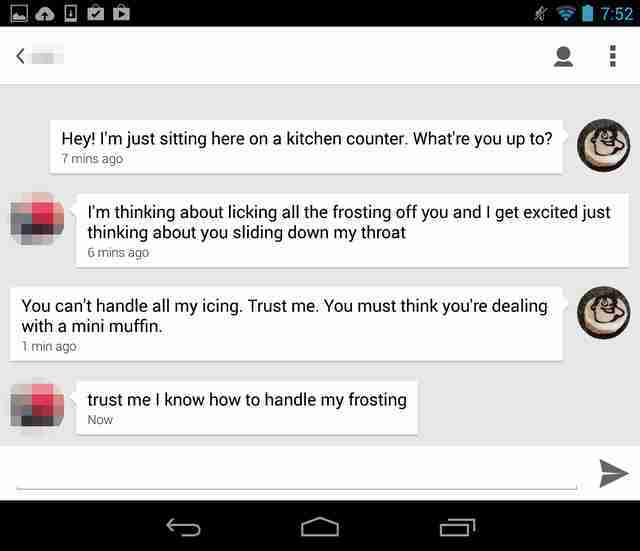 My plan to lure women in as a cupcake worked. Oh, did it work. I've used dating sites in the past with little to no shame. I've even paid to use them. And I've met some nice people, including the woman I'm currently dating, who thought this project of mine was a good idea. I don't think she could have predicted the extent to which women would throw themselves at me. She probably never would've agreed to it. This was me for the night. I named myself in honor of a real-life Connor I had just emailed. 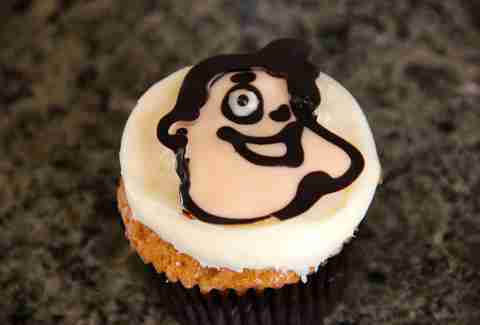 He looks nothing like this cupcake. But he's a confident, tall dude who's much younger than me, so I figured if I stole his name, some of his swagger might rub off on the character. I couldn't have been more right. First, I filled out Connor Cupcake's Facebook profile with some photos to give women a sense of who this guy was. The caption on this photo read, "FRIDAY NIGHT! YOU KNOW HOW WE DO. #workhard #playharder." Here's the profile even nutritionally disciplined women could not resist. I did this at around 5pm. I swiped for about an hour and got no matches. I didn't realize that no one is on Tinder at 5pm, having never used it before, and thought this project was a failure. I even sent an email to my boss with the subject line, "Why won't any girls like me?!?!!?! ?," an email subject I'm sure I also used when I was 15. 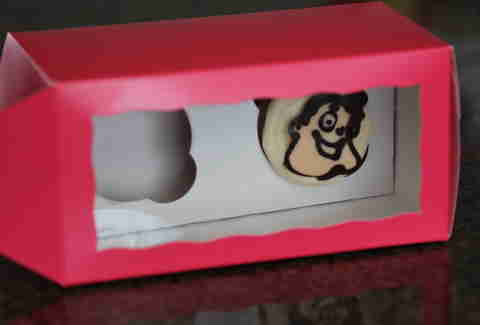 I began feeling like I was being rejected, not the cupcake. This is an actual note I took around that time. 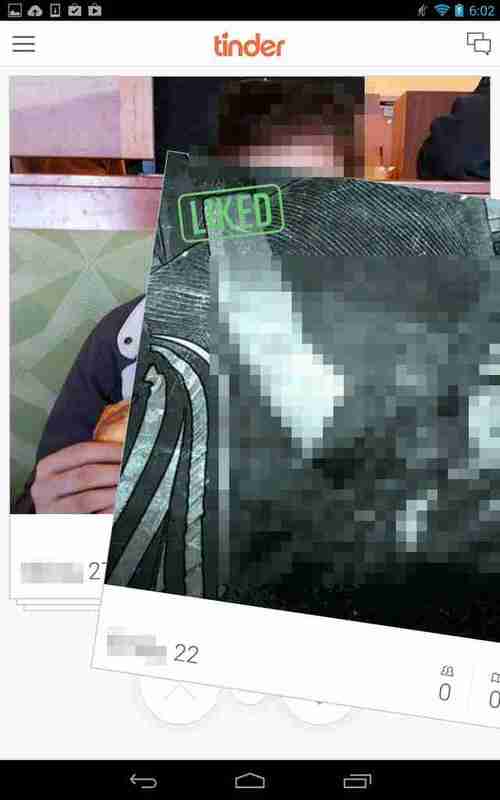 See if you can spot the sadness embedded in this nugget: "I must've swiped 300 girls by now. Nothing." And then, out of the blue, my first match! I messaged her immediately. Things got dirty right away. I knew I was onto something. 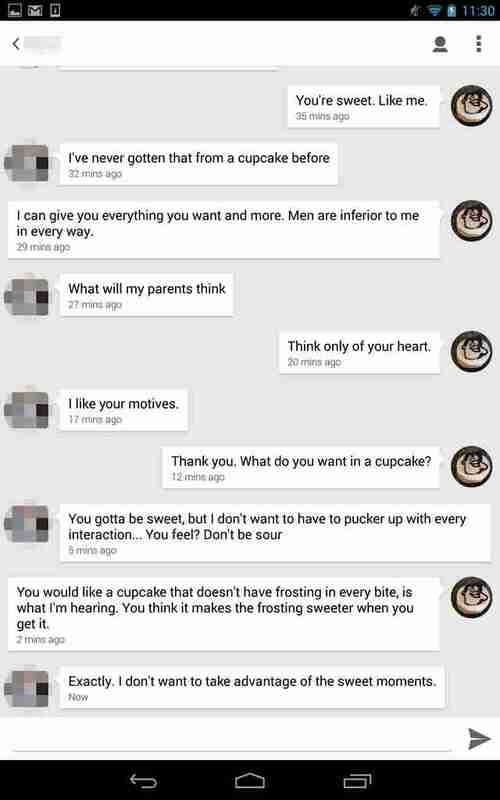 Some women just want a cupcake, and don't even care to learn what flavor it is. This cupcake costs $750. Repeat: This cupcake costs $750. 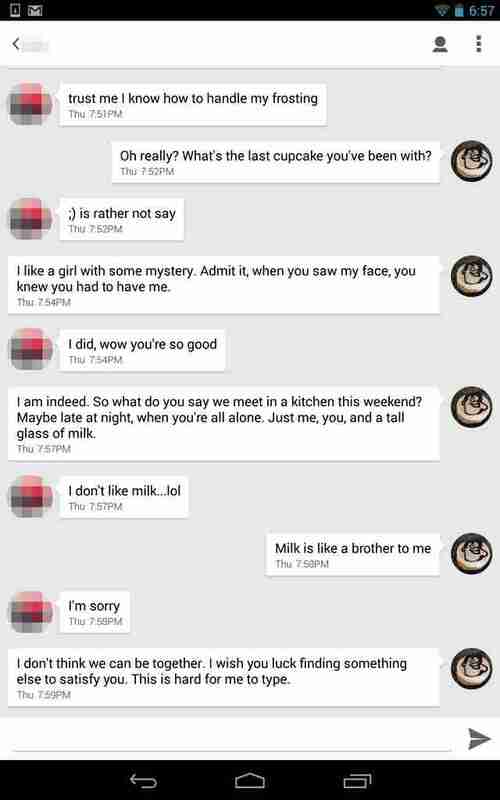 I continued talking to this girl, because I thought she would be the only woman to like the cupcake. And, then, it was revealed she didn't like milk. I stopped talking to her. People who don't get along with your friends are not worth dating. 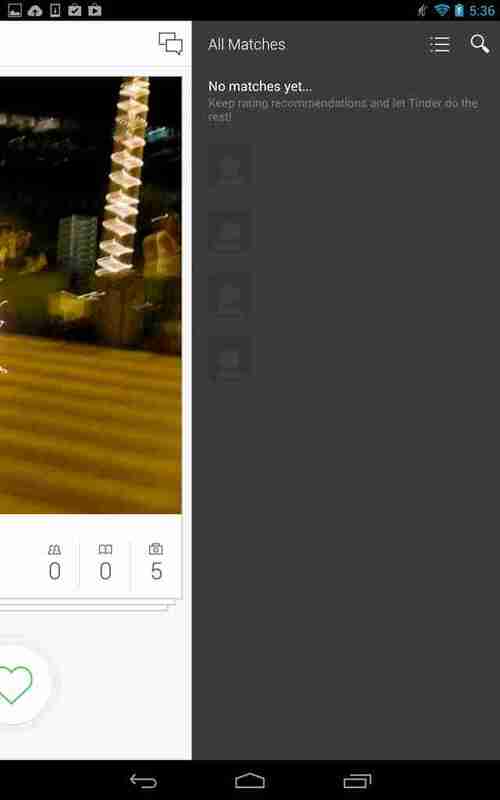 As the night wore on, I began to get more matches, and I became pickier with the girls I would really engage with. As in, I began treating this how I actually used dating sites. My personality and the cupcake's were merging right before my eyes. This woman made it clear I wasn't going to be enough for her. Some women can't be tied down to one cupcake. 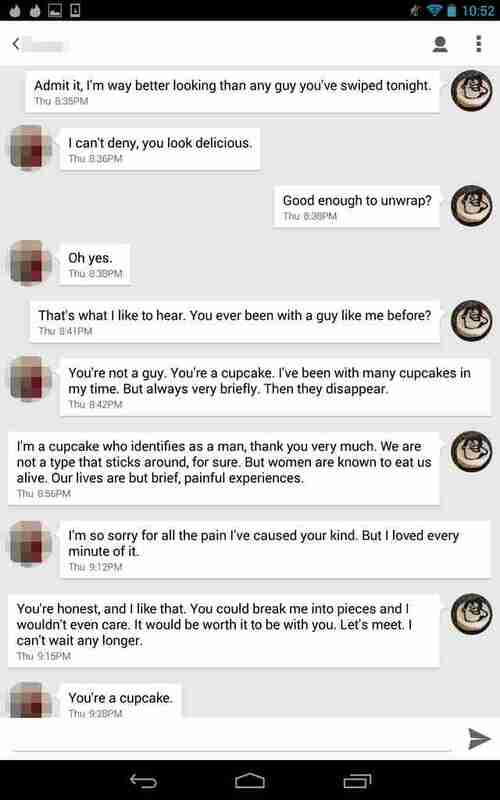 Some women are aware of the power they wield and don't care about leaving cupcakes to deal with the ensuing emotional wreckage. Sometimes you don't need to make the first move. If she's talking about getting with your cousin a few minutes into meeting you, cease all communication with her. Having "bakery smarts" is just as important as looking good in the fridge. A cloyingly sweet cupcake is not a fun cupcake to be around. Second place is respectable in a race, not a relationship. Where Are Tinder Users Trying to Get Laid the Most? Sometimes being the popular guy is a hassle. 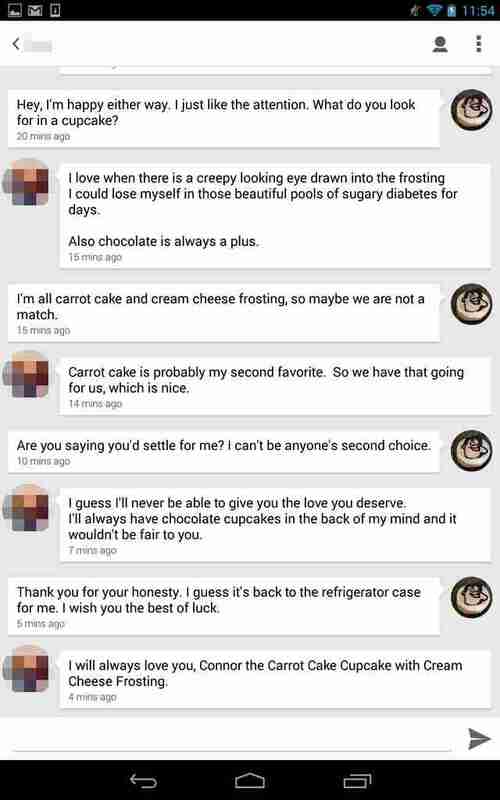 I got more attention as a cupcake on Tinder than I have on any dating site I've ever joined. Which sounds kind of sad. Let me rephrase... no, actually that's about right. 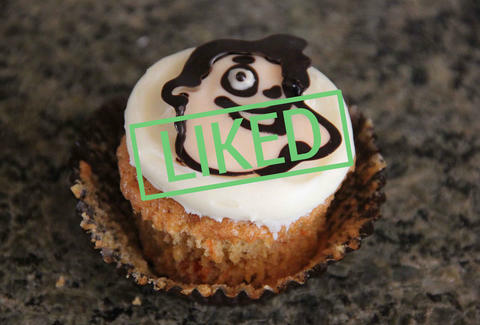 Women are naturally drawn to cupcakes. They can't help it. The other thing I learned is that being yourself on a dating site is the best way to attract others. If you're a cupcake, act like a goddamn cupcake. 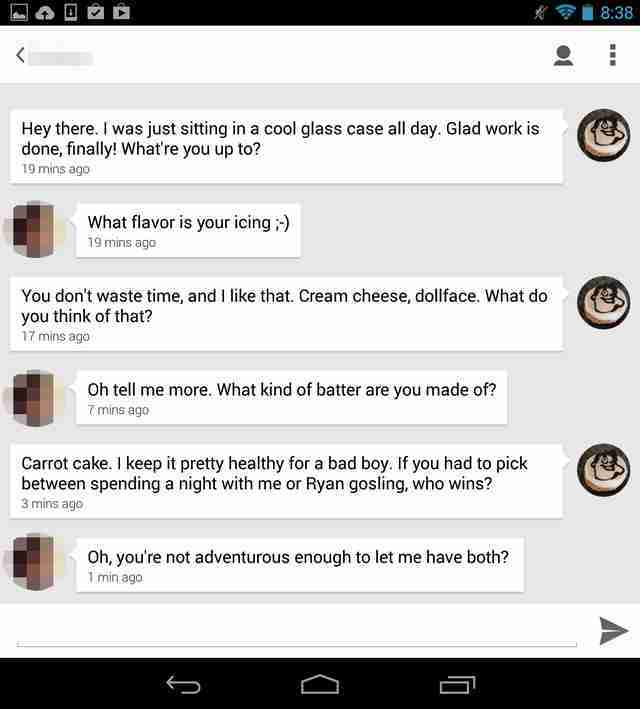 Every woman on there engaged with me because I was so f*&^ing cupcake-y. Just maybe don't try it with cottage cheese. 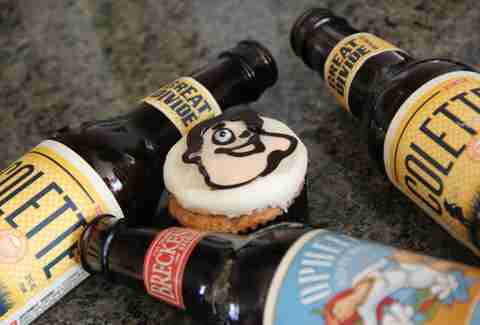 Lee Breslouer writes about food and drink for Thrillist, and would take a cupcake over a donut every day of the week. Follow him at @LeeBreslouer, because you can't make up a name that good. This article was originally published on April 27, 2014.